Will Success Spoil the Hideout? Like many working stiffs Tom Nicholson likes to meet his buddies for a drink at the end of the day. He sells rocks to road builders, and about 30 years ago he often found himself on the same jobs as a guy from U.S. Steel named Tom Shaughnessy. One night Shaughnessy introduced Nicholson to his favorite place to grab a beer and a snack before heading home, and soon Nicholson was a regular too. But the exact location of that lumpen haven, aptly known as the Hideout, was always a mystery to Nicholson's family out in Mount Prospect--even to his wife. After Nicholson's daughter Katie graduated from the University of Texas in 1984, she moved to Logan Square, just a few miles from her dad's stomping grounds. She asked him where the old watering hole was, but he still wouldn't say. Intrigued, she pressed his friends for clues, but they too played dumb. Once she ran into a childhood friend who was sporting a Hideout windbreaker and slyly asked, "Where's that place again?" Even he just wagged a finger at her and said, "No, no, no." Then her father, in a moment of weakness, let on that the bar was just north of North Avenue. After two full days spent combing the area, Katie and her husband to be, Tim Tuten, hit pay dirt: tucked in next to a brick mail-order warehouse just east of Elston, at 1354 W. Wabansia, was a small tar-papered house with an Old Style sign creaking in the wind. The name of the place was nowhere to be seen, but Katie says, "I knew it was the Hideout." She and Tim went in, ordered a beer, and called her dad to say the jig was up. 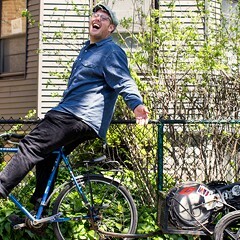 A decade later Katie, Tim, and Tim's longtime pals Mike and Jim Hinchsliff (who are identical twins) own the Hideout, and one of Chicago's best-kept secrets is reluctantly coming out of hiding. 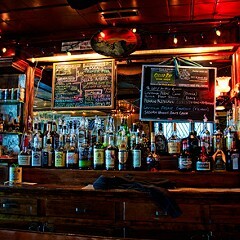 Despite the new owners' refusal to advertise or modernize, in the last two years the bar's reputation has grown steadily by word of mouth. "When we first took over, one of the regulars said, 'You're not going to turn this into a yuppie bar, are you?'" says Tim. "We were conscious of the situation and we didn't want to displace the regulars." From the outside the place still looks like a misplaced Mississippi juke joint, and though the two cozy, low-ceilinged rooms inside are obviously well maintained, there's nothing fancy about them. But in a small concession to new patrons, the owners did recently hang a hand-painted shingle on the fence at the corner of Wabansia and Elston. And while by day the Hideout remains a working-class bar, with most of the stools occupied by middle-aged guys in Dickies, the owners have pushed closing time back from 8 PM to 2 AM and in the last year have begun to book live roots-rock music into the back room. In short, they've watched the Hideout become a place where regular joes and alt-country hipsters not only tolerate each other but even occasionally interact. "When we first opened a friend of ours brought in a woman who worked at the MCA and she sat down and talked to Big Billy the welder for an hour," says Katie. "I have no idea what they were talking about, but you don't see that too often." According to Tim, who teaches history at a public high school, the Hideout first opened in 1934, though the building dates back to the 1890s. For most of its life the bar has been frequented by employees of the factories surrounding it, at one time including outposts of U.S. Steel and Procter & Gamble. But when inner-city industry waned in the 80s, so did the bar's business. 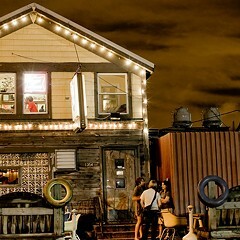 By the time the four friends became patrons, says Tim, the Hideout was badly in need of physical and spiritual repair. "In pretty much any environment I'll start saying things like, 'You know what you could do with this place? You could do this and that,'" he says. "And Phil [Favia, the owner] would say, 'You buy the bar, you do what you want to do.' It was kind of a joke that went on for eight years. The other guys in the bar didn't care as long as we kept buying them rounds. But then we all kind of grew up and thought to ourselves that we'd never buy it, that it was just a thought we had when we were young." Katie had gone on to work for Catholic Charities, Mike was selling paper products, and Jim was a financial analyst in 1994, when Favia died. The following year his wife, Eleanor, ran the place, but it wasn't long before she asked Tim, "'Weren't you guys going to buy this bar, didn't you used to talk about that?' And we were like, 'Yeah, but that was when we were in our 20s. Now we're too old for this,'" Tim says. "She told me, 'Phil said you were serious, you were Mr. Big Shot telling everyone that you were going to buy this place, and now you're not going to do it.' I told the other guys that she was really mad at me that we weren't going to buy it. Together we decided that we had to find a way." "We never wanted to run a bar," says Katie. "We were only interested in the Hideout." It was slow going in those early days, in the fall of 1996, as the foursome replaced beer coolers and fixed up the bathrooms in their spare time. Some old regulars who'd drifted off in the 80s came back; new customers trickled in. Former Bottle Rockets bassist Tom Ray and local washboard player Rick "Cookin'" Sherry noticed the Hideout en route to Home Depot one afternoon and decided to stop in. 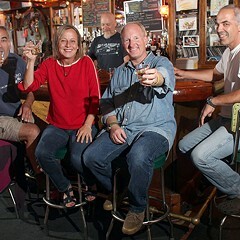 Over beers they talked with Katie, who turned out to be a big Bottle Rockets fan, and by the time they left they'd secured a weekly Tuesday booking for their acoustic blues act, Devil in the Woodpile. Kelly Kessler, formerly half of the country duo Texas Rubies, heard about the bar from a friend, dropped by to check it out, and ended up plotting the "Honky-Tonk Living Room" series, which starts this Thursday at 8:30 PM with Austin folk rocker Jimmy LaFave. 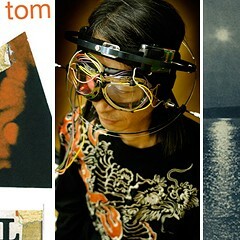 Other acts lined up for the series, which will run the first and third Thursdays of each month starting in September, are Edith Frost, Jon Langford, Deanna Varagona, performance artist Matthew Owens, Steve Dawson and Diane Christiansen of Dolly Varden, and Andrew Bird. The new owners will also celebrate their second anniversary a month early, on Saturday, September 19, so they can throw the party outdoors. Call 773-227-4433 for recorded information about future bookings (or check Reader listings), because they have no plans to start advertising--Katie, who's turned down several previous requests for interviews, still worries that new business might push out the old. So far it hasn't, she says, but "we actually did have to break down and buy three martini glasses recently." Art accompanying story in printed newspaper (not available in this archive): Mike Hinchsliff, Tim Tuten, Kathie Tuten, Jim Hinchsliff, Kelly Kessler photo by Nathan Mandell.